The tragic news of the brutal murder of Javier Valdez Cárdenas, a Mexican journalist renowned for his fearless reporting of the drug war wreaking havoc across Mexico, has sent shockwaves through the country. His journalism was particularly well-known in his home town of Culiacán, in Sinaloa. There, thousands of people are virtual hostages of a war between ruthless drug cartels and a government that is at best, unable to protect its people and, at worse, in collusion with those it claims to be fighting against. Javier was gunned down by unidentified men near the office of Riodoce, the weekly newspaper he founded and one of the few in the state still reporting on the wave of deaths sweeping through the area. As news broke of the shooting that ended his life, messages poured in from all corners of Mexico -- and the rest of the world. Javier was one of those journalists who was a source of reliable information and was respected by all. But one of the messages sent in the aftermath stood out; perhaps because of its irony. Soon after the news of the crime went public, Mexican President Enrique Peña Nieto said his government was “committed to press freedom” and that he had instructed federal prosecutors to help with the investigation initiated by state authorities. President Peña Nieto should not be shocked about Javier’s killing. In fact, if he had been watching the news at all since January, he should not even be surprised. Javier was the sixth journalist murdered in Mexico since the beginning of 2017, as punishment for their work. According to the organization Article 19, 106 journalists have been murdered in Mexico since 2000, 33 of them since Peña Nieto took office nearly five years ago. That is one journalist killed every month. In Mexico, journalism is a deadly business. Maximino Rodríguez, Cecilio Pineda, Ricardo Monlui, Miroslava Breach, Jonathan Rodríguez and Javier all died doing a profession that should not just be celebrated; but protected by the authorities. 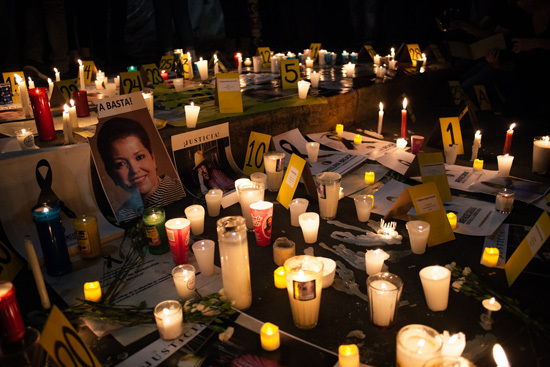 Journalists are at the forefront of Mexico´s human rights crisis. For many of them, taking deadly risks to shine a light on the country’s ills is part of their daily routine. The situation is particularly serious the more you travel away from Mexico City. Harassed by powerful drug cartels and ignored by local and federal authorities (who are often known to be working in collusion with criminal groups), journalists have nowhere to run for protection. But their unbreakable commitment is what keeps them going, despite the threats, the dangers and the little recognition and support. Many of those who were killed since January, including Javier, had reported receiving numerous threats before being murdered. But time and time again, these warnings have been ignored by the authorities. Investigations into the 106 murders of journalists since 2000 have been poor, at best. Not one person has been held accountable for any of these crimes, sending the chilling message that shooting journalists is actually allowed. In 2010, Mexico proudly inaugurated a new special prosecutor’s office for crimes against freedom of expression, but so far it has proven utterly inefficient, as has the protection mechanism for human rights defenders and journalists, another initiative the authorities are extremely proud of. There is absolutely no question that the wave of attacks against journalists is on the rise so why aren´t authorities doing more to stop this open season on media workers? Are they afraid of what these journalists might uncover? Mexico faces a serious human rights crisis with more than 30,000 people currently disappeared, executions rife and torture a common “method of investigation” by police. Without the brave work of journalists like Javier, many of these abuses would never see the light of day. But instead of protecting their work and recognizing the key contribution journalists make in the fight for justice in Mexico, the Peña Nieto administration chooses to focus their efforts on deploying the military in a bid to tackle violence with more violence – a strategy that will do nothing but exacerbate a situation that is already out of control. President Peña Nieto is wrong. Instead of tweeting empty promises, his administration should focus all efforts in developing a comprehensive strategy to prevent and respond to violence and attacks against human rights defenders and journalists. A strategy that goes beyond supportive tweets and public speeches about freedom of expression, and is effectively funded and implemented. Above all, it needs to stop the almost complete impunity for these crimes. And if the Peña Nieto administration is not up to this challenge, it should have the humility to call for help from international experts or organizations, specialized in investigating human rights abuses and fully comply with recommendations made by the United Nations and the Inter-American Human Rights system. When a well-known journalist like Javier is murdered in cold blood, it sends a death threat to all reporters in every corner of Mexico. As the country tries to cope with the news of Javier’s tragic end, the question in everybody’s mind is: who will be next? Only action can end this bloodshed. Anything less – even nicely worded tweets – will no longer do.